It has not yet been mentioned on this blog that Volumes 10 and 11 of the Munich Commentary on the German Civil Code (Münchener Kommentar zum Bürgerlichen Gesetzbuch), are now available in their sixth edition (2015). 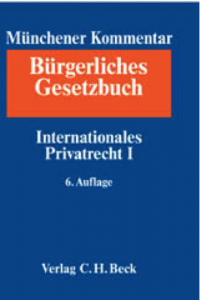 A standard German language treatise on both German and European private international law, the new edition contains a detailed article-by-article analysis of the Rome I, II and III Regulations (by Abbo Junker, Munich; Dieter Martiny, Hamburg/Frankfurt an der Oder); Ulrich Spellenberg, Bayreuth; Peter Winkler von Mohrenfels, Rostock), the Hague Protocol on Maintenance (Kurt Siehr, Hamburg/Zurich), the European Succession Regulation (Anatol Dutta, Regensburg), and the Hague Conventions on the Protection of Children and Adults (by Kurt Siehr, Hamburg/ Zurich; Volker Lipp, Göttingen). The sixth edition of Volumes 10 and 11 is the first edition that has been edited by our co-editor Jan von Hein (Freiburg/Germany) as the volume editor. Jan is the successor to Hans-Jürgen Sonnenberger (Munich) and has contributed to the commentary himself with a completely new section on the general principles of European and German private international law.